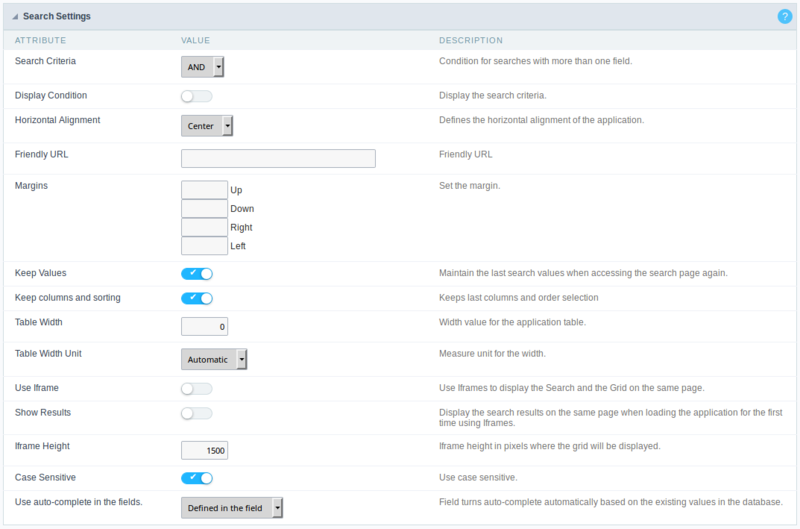 Through these attributes you can define some general search settings such as alignment, width, search conditions, etc. Margins : Allows you to set the Search aplication positioning (margins). Keep Values : When this option is activated the last searched values are going to be maintained and displayed when the system user returns to the search aplication screen. Keep columns and sorting : This option determines if each search should preserve the selected values to the Grid fields columns and sorting, i.e. to each search, these values return to original condition. Table Width : This option sets the search aplication HTML width value, it can be in pixels or percent. You need to set the unit within the option “Table Width Unit”. Use Iframe : When this option is enabled the Search screen and the search results are going to be displayed in the same browser window, using two FRAMES, one above the other. The Search aplication and the Grid with the results are going to be part of the same page. Show Results : This option is associated with the “Use Iframe”. When enabled it will initially displays the Search aplication along with the Grid inside the iframe positioned below the search screen, when disabled initially displays only the Search screen. Iframe Height : This option is also associated with the “Use Iframe”. It sets the height, in pixels, of the iframe where the recovered data will be displayed by the search. Case Sensitive : This option enables the Case Sensitive option.